Artech 90310 is a hermetically sealed, multi-column canister cell that is ideally suited for harsh environmental conditions. The cell housing is mild steel with epoxy enamel paint. NTEP certified for most commonly used capacities. The cell is recommended for tank, truck, track and hopper type industrial applications. 30 foot cable. 10K to 500K pounds capacities. The Artech Model 90310 is a hermetically sealed, multi-column canister cell that is ideally suited for harsh environmental conditions. The load cell housing is mild steel with epoxy enamel paint. NTEP certified for most commonly used capacities referenced below. The load cell is recommended for tank, truck, track and hopper type industrial applications and is available from Central Carolina Scale. 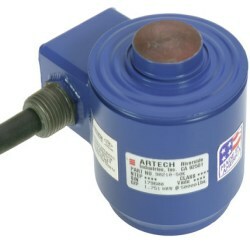 The Artech 90310 load cell is supplied with an integral 30 foot cable.